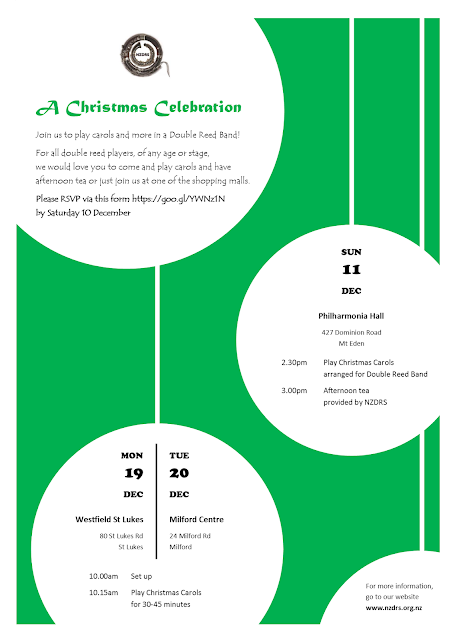 We would like to invite ALL double reed players in the Auckland region to come and play CHRISTMAS MUSIC in a DOUBLE REED BAND.Afternoon tea will be provided by NZDRS. Family members are most welcome to join us. We will provide the music - and it will be EASY! There will be other people playing the same part as you and no one will know whether you are playing the correct notes or playing in tune. We are catering for people on both sides of the bridge! Please fill in your details on this link (just so that we don't run out of strawberries and mince pies).